There's an excitement in the air - like the coming year is a blank slate just waiting to be filled with all sorts of awesomeness. Like this awesome mint-choc-chip ice cream! But more on that in a moment. While I am not really into setting resolutions, at the beginning of a new year I think a certain amount of reflection is good. Some people set goals, some choose a guiding word, some cross their fingers and hope for the best. 1. What do you want more of? 2. What do you want less of? 3. What do you want to introduce? If you sit with each of those questions for a few moments the answers do make themselves known. I want less fear, stress and worry about things that I can't change, less self-recrimination, less feeling that I have to do it all. I want to introduce - more movement, more date nights, a dedicated self-care ritual, to incorporate essential oils more into our daily lives, more fermented foods and a real focus on gut health for myself and Mr 6 especially. I also want to eat more ice cream - if it tastes as good as this one does! I've used a tin of coconut condensed milk here but if you have a Thermomix you can of course make your own with whatever sweetener you choose. I usually would but being time-poor on New Year's Eve and also wanting a very white base I chose to buy some. Totally up to you! Take your already chilled cans of coconut cream, open them carefully and place only the thick creamy parts into the thermomix. Depending how you stored your can in the fridge you may be able to scoop off the cream leaving some watery milk in the tin, or you could pour off the milk leaving the cream behind. Just don't use the milk for this ice cream or it won't work! Beat the cream for 30 secs / SP 4. Add the (already chilled) condensed coconut milk and peppermint oil and whip for another 30 secs / SP 4. 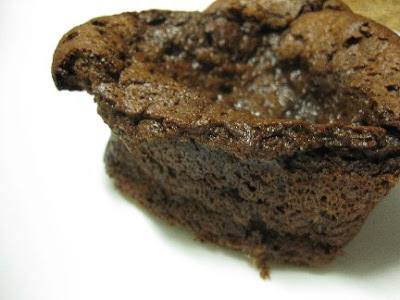 Add the chopped chocolate and mix on reverse / SP 2 for 10 seconds. Pour into a freezer safe container and chill until firm. Or serve immediately for a (very) soft-serve style ice cream. My kids went nuts for this on New Year's Eve and there were arguments over who got to lick the bowl and spatula! If you don't have a Thermomix then a good food processor or blender will work well too! *Not all essential oils are safe for ingestion. Click here for more information on the brand I use and love! 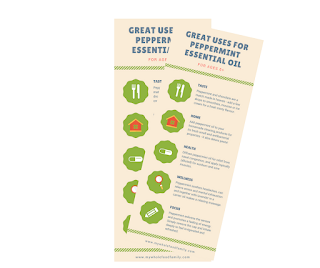 Peppermint is one of my all-time favourite essential oils and to help you experiment with it I've done up a handy printable with some of the best uses for this wonder oil. Just click on the image below to grab your copy! We're having a public holiday here today in honour of the Ekka, otherwise known as the Royal Queensland Show. Gotta love a day off in the middle of the week! I have such fond memories of going to the Ekka as a child - catching the train in with huge crowds of people, feeding the animals, climbing into the rickety stands to watch the dog show, eating a dagwood dog and a strawberry sundae. We've never actually taken the kids to the Ekka and we're not going this year either. Mr 2 still has a daytime sleep and also broke his arm a few weeks ago so has a sling on. It all seems too hard. Next year the boys will be 8, 6 and 3 which I think will be perfect for them to handle a full day out and enjoy all the different activities. I have to say, ice cream has always been my weakness. Back when I was a bit of a sugar addict I would easily eat a tub a week (if not more). Terrible right? Well it's now been almost 3 years since I ate commercial ice cream. And I'm totally ok with that. The ice cream they use for the strawberry sundaes at the Ekka is actually great quality, so perhaps next year my kids will experience the joy of having one. 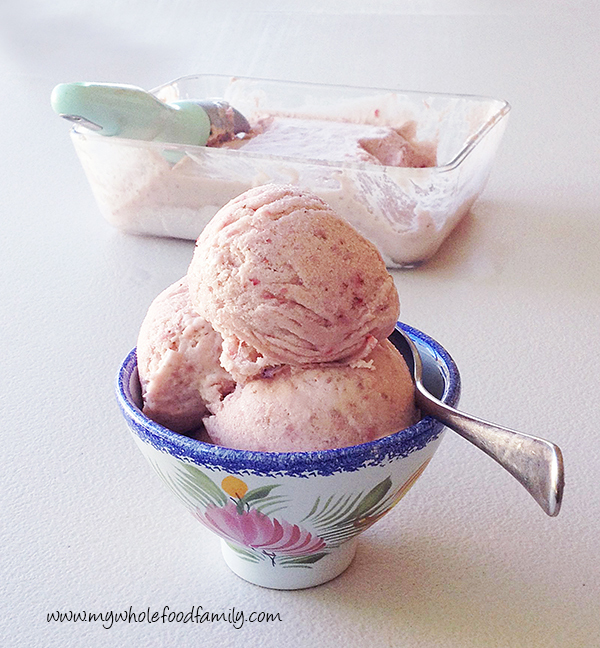 Until then though my dairy-free strawberry ice cream will definitely satisfy everyone. I made this ice cream a little differently than I have in the past. I know from past experience that adding strawberries can really water down the mixture making it very icy, or leave you with pebbles of rock hard frozen strawberry that will break your teeth. This time I was careful to make the custard base extra thick and creamy and use very ripe strawberries for maximum flavour. Just divine. 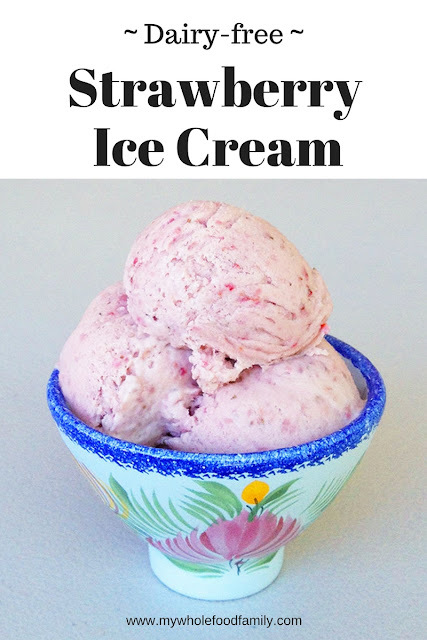 Smooth and creamy ice cream with big strawberry flavour. The kids declared it to be 'the best ice cream ever' (although they do have short memories because my chocolate ice cream formerly held that lofty honour). This really was so simple to make. If you don't have a Thermomix, I would recommend beating the eggs, syrup and arrowroot together in a large bowl until smooth. Warm the coconut milk and vanilla in a medium pot then pour over the egg mixture and whisk together well, then pour the mixture back into the pot and stir over medium heat until the custard has thickened. The follow the instructions below for adding the strawberries, churning and freezing. Place the strawberries and 40g of rice malt syrup into the mixing bowl and blend for 10 seconds / SP 5. Pour into a small bowl and set aside. Without washing the bowl, add all remaining ingredients and cook for 7 minutes / 90 degrees / SP 4. It will be very thick and creamy. Remove the lid and leave to cool for 20 minutes. Add the strawberry puree and blend for 5 seconds / SP 4. 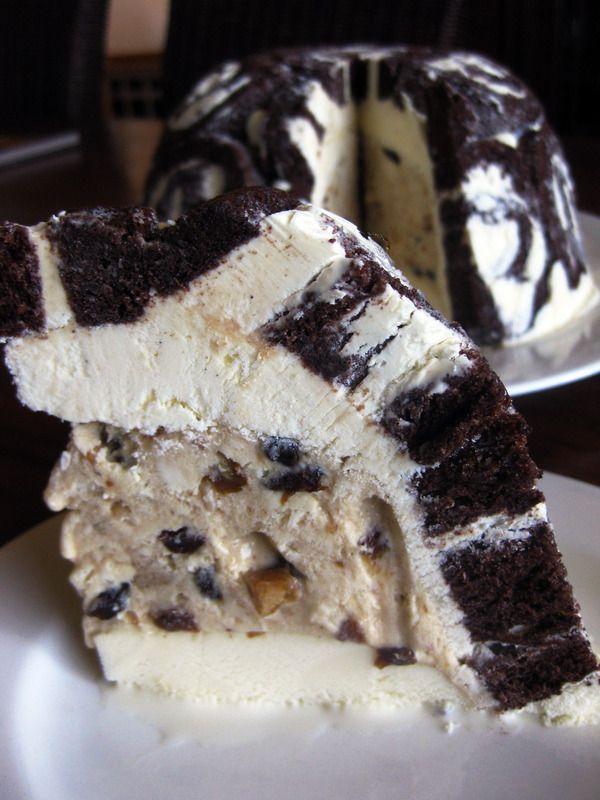 Place into the fridge to cool completely (several hours). Pour into ice cream maker and churn as per manufacturer's instructions - about 20 minutes. Enjoy straight away as soft serve or pour into a glass container and freeze for a few hours until firm enough to scoop. Linked up to Thriving on Thursdays. I just sat my first exam in 13 years yesterday. It was for anatomy and physiology and seeing I have no background in science it has been a little out of my comfort zone. I actually feel really confident that I have passed but the perfectionist in me keeps going over and over what I could have done better. So annoying! But this one really is too good not to share. 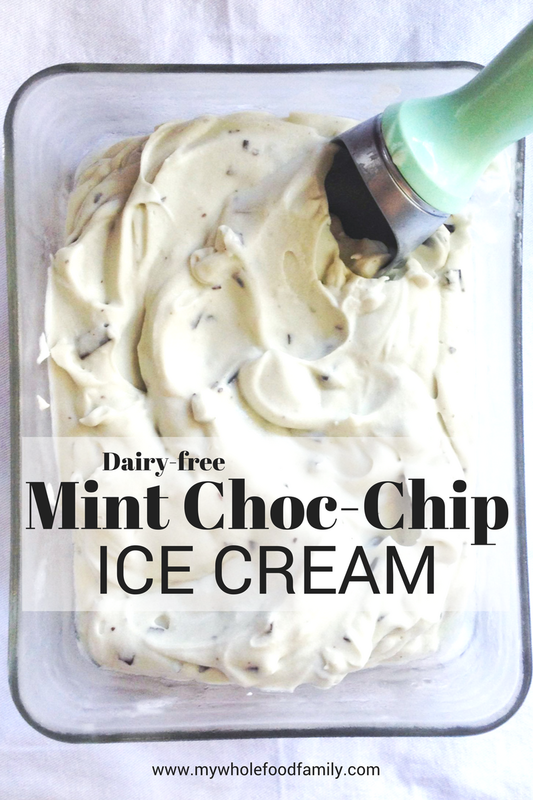 I mean how often do you find an ice cream recipe that not only tastes amazing but is dairy free, coconut free and nut free? Noah is now 9 months old which means I have been dairy free for almost 9 months as well! If you'd asked me previously whether I ever thought I could give up dairy I would have laughed. I LOVE my dairy ... butter, cheese and especially ice cream. But it has been surprisingly easy and I don't really miss it all that much. Probably it was easier to start with because I was doing it for Noah (no one wants their baby crying with pain and reflux) but I actually feel really well and have lost the baby weight so much faster than before. Win-win. I make a brilliant dairy-free white sauce which means we can still enjoy lasagne and tuna mornay. I've been happily drinking rice milk and now that I have the Thermomix I am making lots of different milks. But I haven't had as much luck with dairy free ice cream. Most of the ones I've seen and tried are based around coconut cream. I don't mind them but most of the time I don't want my ice cream to taste like coconut! 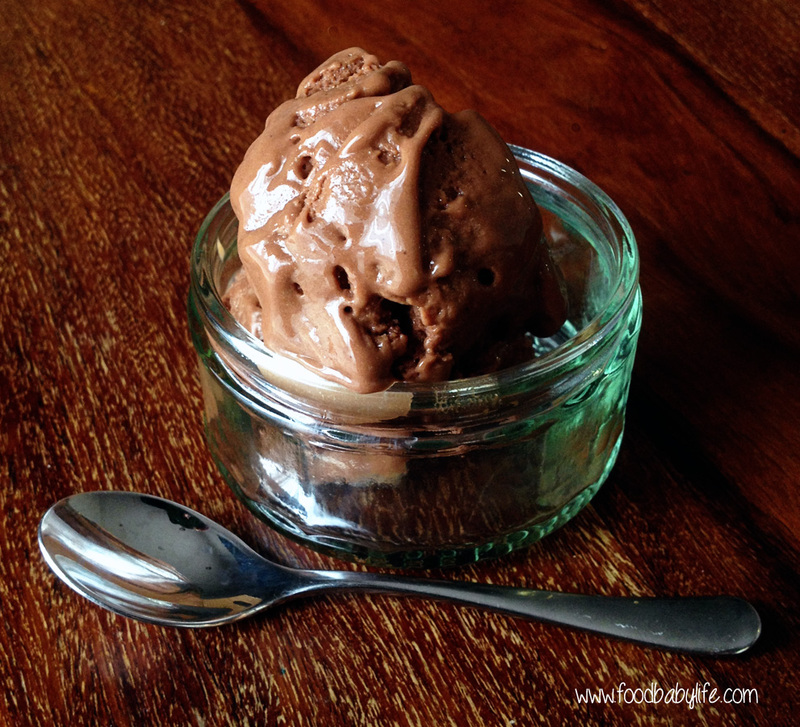 That's why I was so excited to see this gelato recipe from The Paleo Mom. It is dairy free but without the usual coconut or almond milks to take away from the flavour of the chocolate. I tweaked the recipe a little by adding some rice malt syrup (which makes it no longer paleo seeing rice is a grain) but I wanted the kids to enjoy it and it would have been very intensely chocolatey otherwise. I also did the first few steps in the Thermomix in order to cook the egg yolks and will include those instructions as well. This makes the most delicious, darkly intense chocolate gelato. 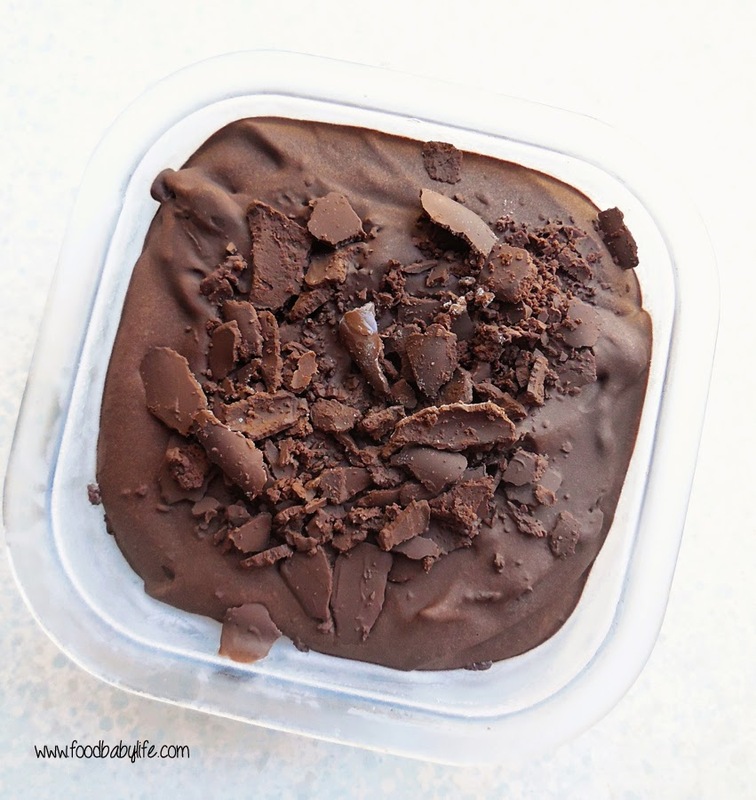 My kids loved it too but it's not your typical chocolate ice cream! Roughly chop the chocolate, add the rice malt syrup and pour over the 1 cup of hot water. Stir gently until completely combined. Mix the egg yolks together in a small bowl. To temper the yolks add a small ladle of the hot chocolate mixture to the yolks and stir continuously. Keep stirring and add a second ladle. Pour the egg and chocolate mixture back into the rest of the chocolate and mix thoroughly. Place the chocolate mixture in a blender. Add the vanilla and salt. With the blender on low speed, add the 1 1/2 cups ice water a little at a time, blending between each addition, or just drizzle the ice water through lid by removing the insert. 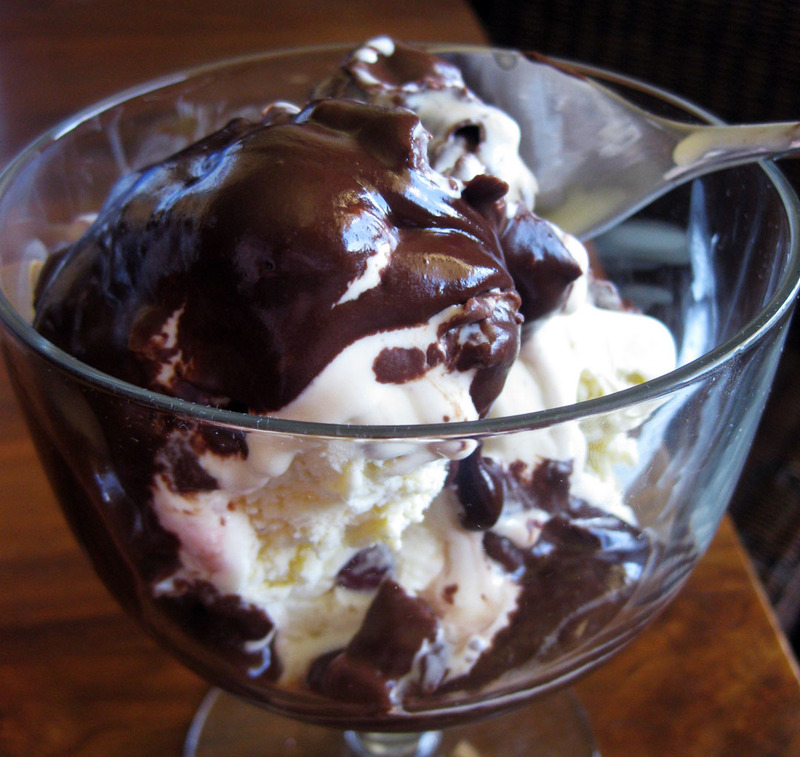 Place the chocolate mixture in an ice cream maker and churn according to the manufacturer’s instructions. 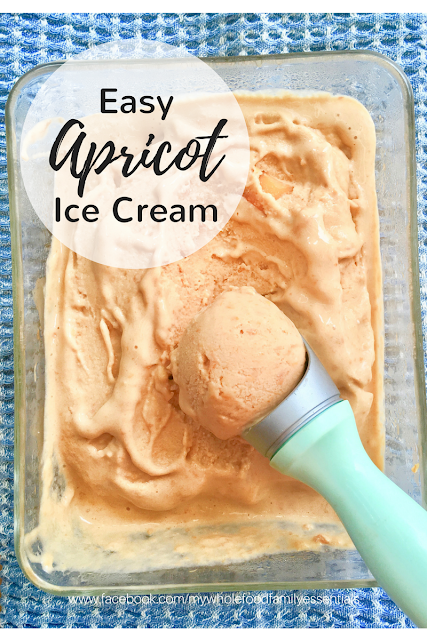 Once it’s soft-serve consistency, place the gelato into a freezer-safe container and freezer for about 2 hours to get a perfect scoopable consistency. If freezing for longer than that, remove from the freezer and place in the fridge for about an hour before you serve, or 20 minutes on the bench. Thermomix instructions - break the chocolate into pieces, pour over the hot water and melt for 2-3 minutes/50 degrees/speed 3. Scrape down the sides as needed. Add the rice malt syrup, vanilla and salt and mix 3 sec/speed 4. Break up the egg yolks then add to the mixing bowl and cook for 3 minutes/90 degrees/speed 3. Leave to cool for 10 minutes. While running at speed 4, remove the measuring cup and drizzle in the ice water until well combined. Pour the mixture into a bowl and place in the fridge until completely chilled then follow instructions above to churn and freeze. You'll notice in the top photo there are lots of yummy looking chocolate flakes on top of the gelato. This was just some of the mixture that set hard in the ice cream maker and got scraped off into shards after pouring out the gelato. Not sure why that happened but it gave a lovely texture. Like most homemade ice creams this really is best served pretty much straight away. So if you can serve it after the 2 hours in the freezer that would be ideal. Secret Recipe Club time! I really wasn't sure whether to participate this month or not as our baby's due date was 30th October. Luckily though I made a great call figuring he would be early and I was right! 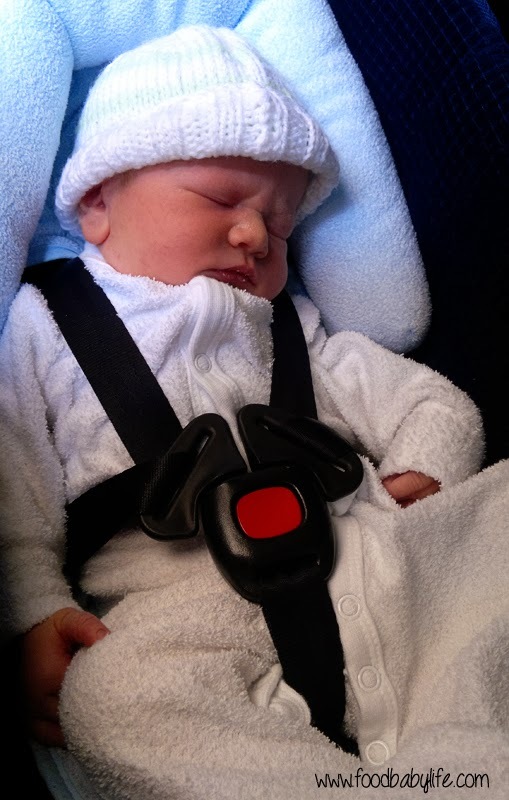 Our third gorgeous little boy arrived on Monday 21st October. I will be taking next month off so we can settle in without any pressure on me to cook but I will back with SRC in December/January. Meanwhile my hubby has really stepped up and made us some delicious meals including macaroni and cheese and a slow-roasted pork belly. Yum! It feels like a lifetime ago when I made my pick for this month's SRC. I was assigned the Bewitching Kitchen by Sally and once again I was really spoilt for choice when it came to choosing a recipe. Sally is Brazilian and it was fascinating to read her story, explore her traditional Brazilian recipes and also read about her background in science (my husband is a microbiologist). When it came to actually choosing a recipe though I couldn't go past ice cream, which has been my major vice this pregnancy. Interestingly enough as I write this after his birth my sweet tooth has virtually gone and I'm wanting smoked salmon, sushi and brie! 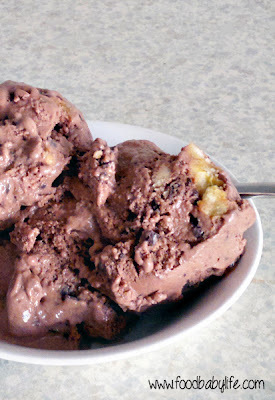 So for this month I chose Sally's Chocolate Frozen Yoghurt with Caramelized Bananas. This recipe is worth making just for sheer deliciousness but make sure you check out her post for a beautiful photo and story of her mother, the world's expert on caramelised bananas! Oh and please excuse the terrible photo. It wasn't quite firm enough to scoop properly and it didn't last long enough for me to take another one! Melt the butter in a non-stick pan over medium heat. Add the sliced bananas in a single layer and sprinkle over the brown sugar. Cook, turning once, until caramelised. This will take 5-8 minutes. Add the lemon juice and swirl the pan to completely dissolve the sugar. Remove the pan from the heat. Scrape three-quarters of the bananas into a food processor, add the 60 mls of milk and process until smooth. Transfer to a small bowl and place in the freezer for 15 minutes or until completely chilled. Chop the remaining bananas and freeze until chilled. In the same food processor bowl beat together the cocoa, sugar, salt, vanilla and the remaining 125 mls of milk. Add in the yogurt and then the banana puree and process until smooth. 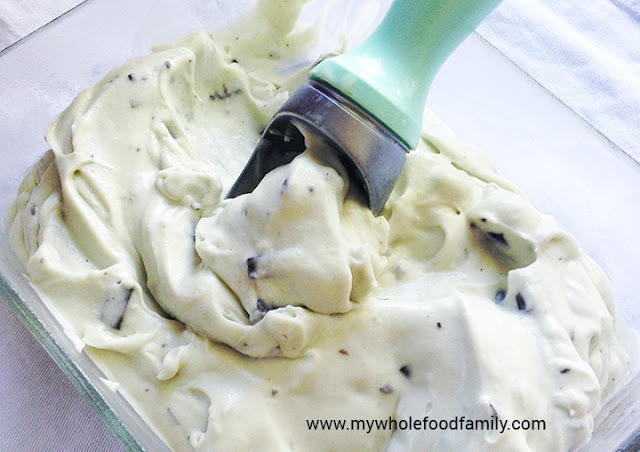 Transfer the mixture to an ice cream maker and churn until nearly frozen. Mix in the chopped bananas and pieces of chocolate. Scrape the frozen yogurt into an airtight container, cover and freeze until firm, at least 2 hours. I used to be obsessed with profiteroles and growing up I always wanted a croquembouche wedding cake. When it came to it we ended up having an awesome cupcake tower but I still love my profiteroles! These were not my finest moment. 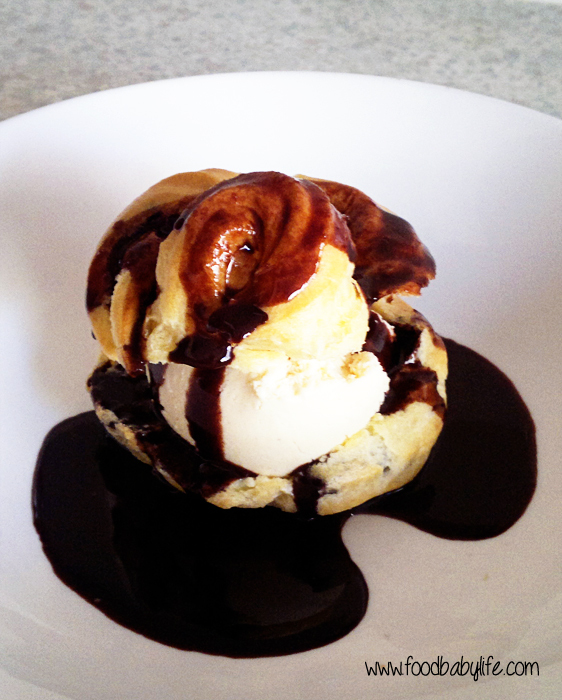 In order to make them child and preggo friendly I left out the espresso and made regular profiteroles. I couldn't find a plain piping tip so had to use a star one and they came out a little odd looking (although they did puff up beautifully). I only used 1/2 ts cinnamon in my eggless ice cream and it had a really blah could-have-been-anything flavour, and then I decided to use a simple cocoa glaze rather than chocolate sauce and made it too thin. BUT put those 3 less than perfect elements together and it was delicious. The fact that I immediately ate 2 with all the trimmings says they couldn't have been too bad! To see what everyone else thought don't forget to check the LYL page! 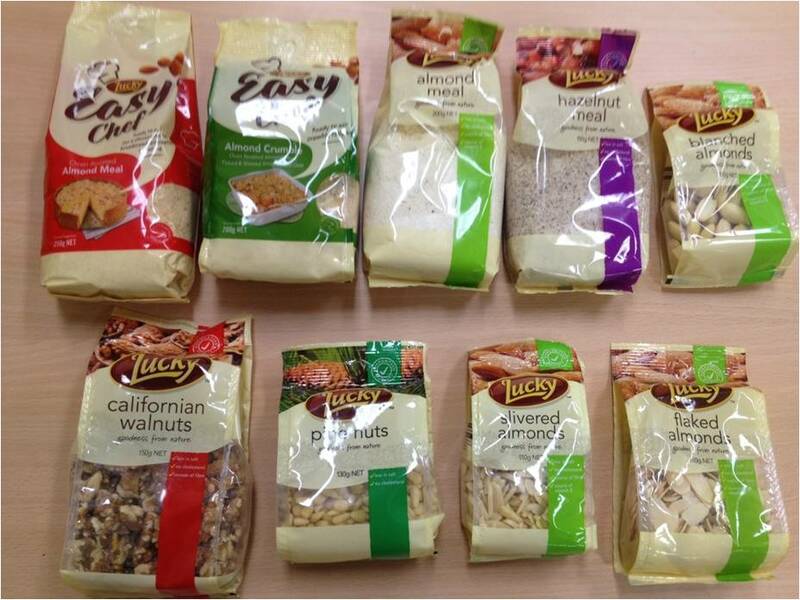 Recently I received a lovely gift bag of nuts from Lucky courtesy of Product Talk by Nuffnang. Just look at that haul! As a baker it made me very, very happy especially in the lead-up to Christmas which is the time of year when I cook with nuts. I grew up watching my mum use Lucky nuts in her Christmas baking and they are what I turn to for special occasion baking too. I didn't actually realise it but Lucky almonds are all grown in Australia and in fact Lucky is the leading cooking nut brand in Australia, so they are definitely doing something right! 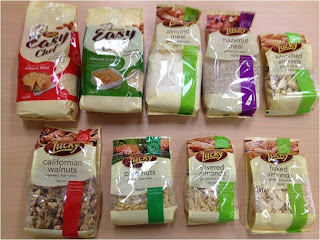 In case you can't see well enough I received a bag each of blanched, slivered and flaked almonds, walnuts, pine nuts, almond and hazelnut meals and 2 new products which I was very excited about. Firstly was a bag of Easy Chef Oven Roasted Almond Meal, which as the packet says it basically a cheesecake base in a bag. So of course I had to make a cheesecake! Secondly was a bag of Easy Chef Almond Crumble which is a mix of almond meal, flaked and slivered almonds with oats and again as the packet says, is a crumble topping in a bag. Perfect. The walnuts didn't make it into my baking but I enjoyed them as a tasty mid-morning snack during the week. The pine nuts are set aside for pesto and the almond meal will be used in a gluten free almond shortbread recipe I am working on for Christmas. The blanched almonds will of course be decorating the tops of my Christmas cakes which aren't ready to bake yet. I ended up making 4 desserts, perfect for Christmas for anytime really - some moist Choc Hazelnut Cakes, a Panforte Ice Cream, Almond Cheesecake and Blueberry Crumble Pie.I'm trying to cut back on sugar so some of my recipes use Natvia. 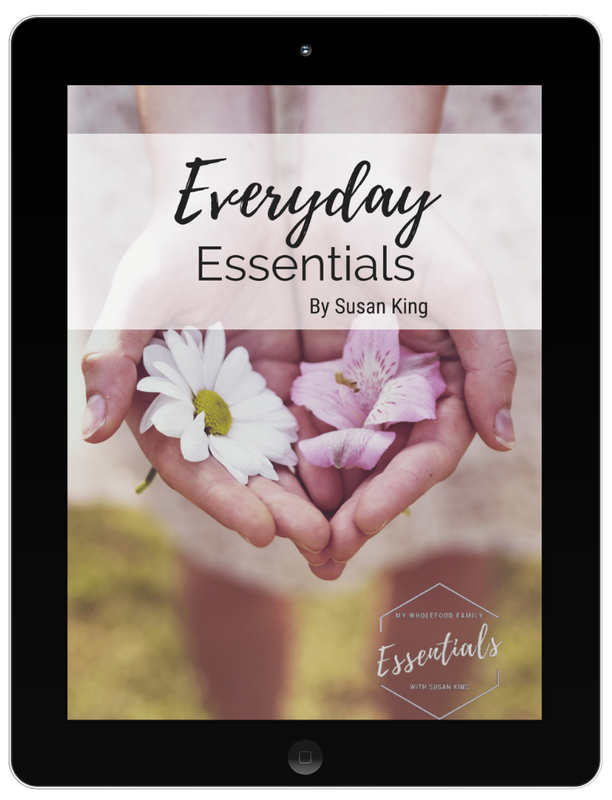 I hope you enjoy these recipes and if you would like to try any Lucky products for yourself, the full range is available in Coles with a smaller range available in Woolies and independent grocery stores. Lightly grease and line the base of a 23cm springform pan. Mix together the Lucky Oven Roasted Almond Meal with the melted butter and Natvia. Spoon into the prepared tin and press over the base and up the sides. Place in the freezer to chill for 30 minutes. 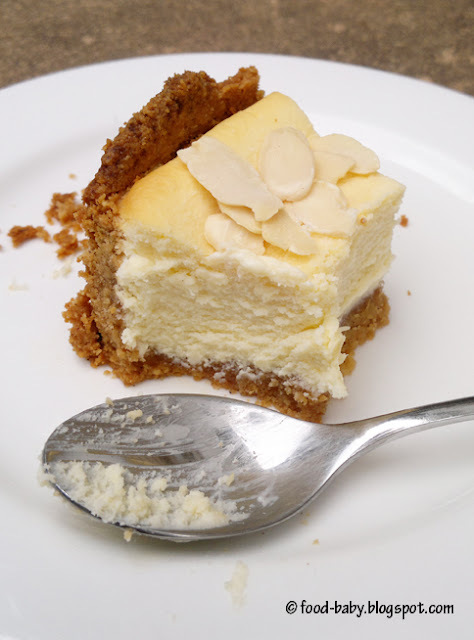 In a food processor or electric mixer, beat together the cream cheese and Natvia until smooth. Add the eggs, vanilla and cream and beat for 3 minutes. Pour the mixture into the prepared base and bake for 35-40 minutes or until cheesecake is lightly golden and just set in the middle. Remove and allow to cool to room temperature before chilling in the fridge for at least 2 hours. Decorate with toasted almonds. Serves 8-10. Warm the milk, Natvia/sugar, spices and orange zest in a medium saucepan. Remove the pan from the heat, cover and leave to steep for 30 minutes. Add the cream and rewarm the mixture. In another large bowl whisk the egg yolks. Pour the warm milk/cream over the yolks, whisking constantly, then pour the mixture back into the saucepan. Cook the custard over medium heat, stirring with a heatproof spatula, until it thickens and coats the spatula. Pour the custard through the strainer into the cream. Mix thoroughly. Place the bowl into an ice bath and stir the custard until it is cool. Chill the mixture thoroughly in the fridge before churning in an ice cream maker according to the manufacturer's instructions. Add the toasted almonds in the last few minutes of churning. Place a baking tray in the oven and preheat to 180 degrees celsius fan forced. Grease the inside of 6 metal dariole molds with butter and dust with flour. Set aside. Melt the chocolate in a small bowl over a pan of simmering water, making sure the water does not touch the bottom of the bowl. Stir in the butter and remove from the heat. Place the whole eggs, egg yolks and sugar in a large bowl and beat with an electric mixer for 5-7 minutes or until light, pale and foamy. Fold the melted chocolate into the eggs and then the hazelnut meal, mixing gently until well combined. Spoon evenly into the prepared molds, place on the baking tray and bake for 8 minutes. Remove from oven and allow to rest for 1-2 minutes, before turning out onto serving plates. 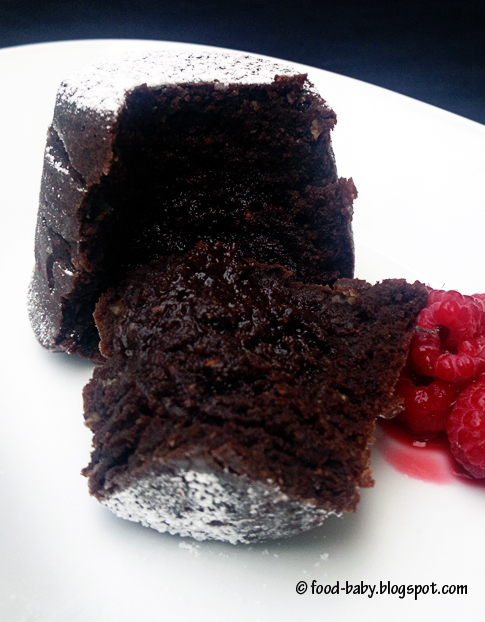 Dust each one with icing sugar and serve with fresh raspberries. Makes 6. Put the flour and sugar in a food processor and pulse just to combine the ingredients. Add the butter and coconut oil and pulse only until the butter and coconut oil are cut into the flour. Gradually add the water, a few tablespoons at a time, until the dough is moist and clumpy. You want to see some pieces of butter. Check to see if the dough will stick together if pinched, and keep pulsing until it does. Tip the dough out onto a piece of cling wrap, bring it together into a disc and refrigerate for at least 1 hour before rolling out. Roll out the dough on a floured work surface or in between 2 pieces of baking paper. Lay the dough out into a greased 9 inch pie pan and trim the edges. Place in the fridge for 30 minutes. Preheat the oven to 180 degrees celsius. Blind bake the pastry shell for 20 minutes, then remove the lining and bake for a further 5 minutes. Place the blueberries, sugar and lemon zest and juice in a saucepan and cook over medium heat until the blueberries have thawed. Add the cornflour and water and cook for a further few minutes until the liquid has thickened and is clear and syrupy. Remove from the heat and cool for 10 minutes. In a medium bowl mix together the Almond Crumble, sugar and cinnamon. Rub in the butter using your fingertips until well combined..
Spoon the filling into the prepared pie shell. 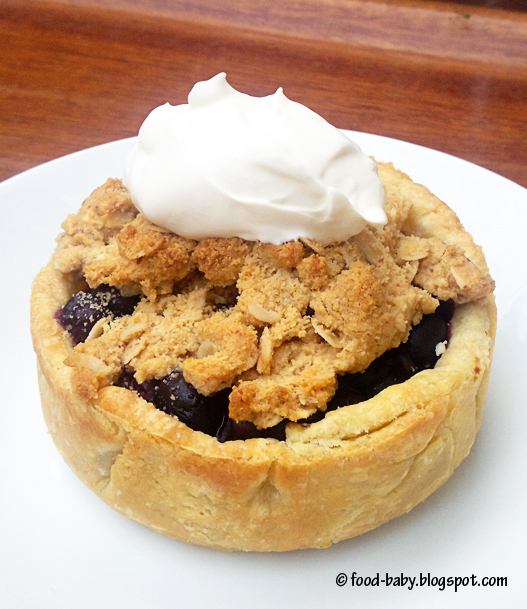 Sprinkle over the crumble topping evenly over the filling leaving a small gap around the edges to show the gorgeous colour of the blueberries. Bake in a preheated 180 degree oven (160 degrees fan forced) for approx 20 minutes until the topping is golden brown and the filling is bubbling. Remove from the oven and allow to cool for 10 minutes before serving with a big dollop of cream. This recipe makes 1 large 9 inch pie or 4 smaller pies. Note - this is not a sponsored post however I did receive product for consideration. For more information see Product Talk by Nuffnang. 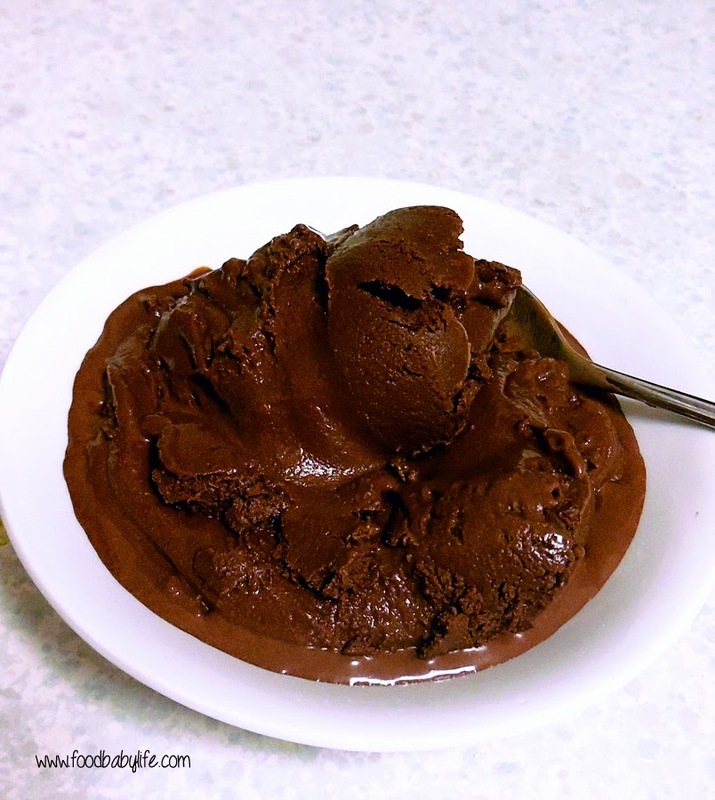 I blogged a few days ago about the amazing Aztec "Hot" Chocolate Ice Cream I made for our Father's Day dinner. Well I also made a more kid-friendly ice cream. 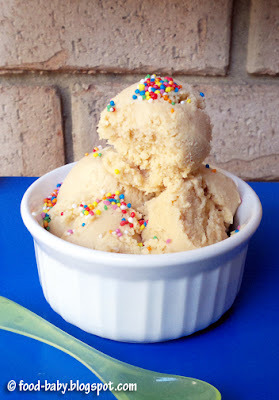 Both my boys love peanut butter so when I saw this recipe it was perfect. It's also such an easy recipe with no cooking involved at all that older kids would be able to make it themselves! 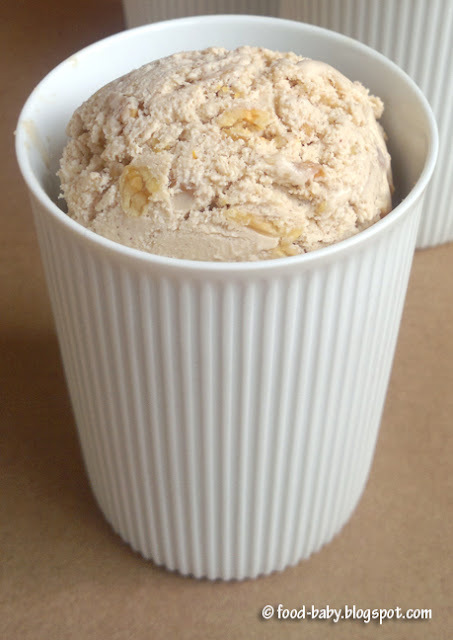 If you love peanut butter you will LOVE this ice cream. I served it with hundreds and thousands but I think having it in a sundae with hot chocolate fudge sauce and a scattering of roasted salted peanuts would be divine. Yum! Puree all ingredients in a food processor until smooth. Chill thoroughly in the fridge then churn in your ice cream machine according to the manufacturer's instructions. It was Father's Day here in Australia yesterday, so belated good wishes for all the amazing dads out there! We didn't really have the best weekend, with 3 out of 4 of us coming down with a bad cold and cough, and poor Charlie had conjunctivitis as well. Needless to say there were no fun father's day activities to be had, unless you count hubby and Oscar going to the library and to Coles to pick up a few essentials. Oh well, there's always next year! In spite of feeling like crap I still cooked up a storm, doing toasted ham and cheese croissants for breakfast, this creamy prawn curry with naan for dinner and of course a yummy dessert. You really can't go wrong with chocolate for my husband. He is the ultimate chocoholic! 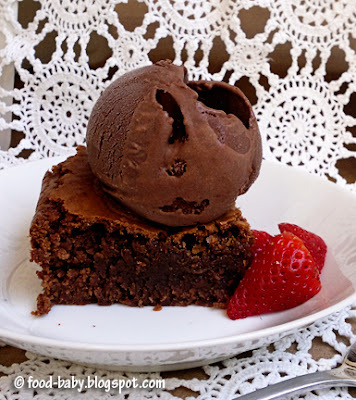 So what better for a decadent Father's Day dessert than these amazing fudgy brownies topped with a spicy chocolate ice cream? I spotted this ice cream recipe in The Perfect Scoop on my first read flick through. It is a Philadelphia style (no eggs) chocolate ice cream with cinnamon, chili and brandy to give it some kick. I also added the zest of an orange to ramp up the flavour. Sensational! Incredibly smooth and luscious but with a bit of a fiery kick at the same time. Hubby said it tasted like Christmas. Adding alcohol to ice cream stops it from setting too hard and I definitely think that's what made the texture so luscious. Served on top of a fudgy chocolate brownie this was a chocoholic's dream. Success. 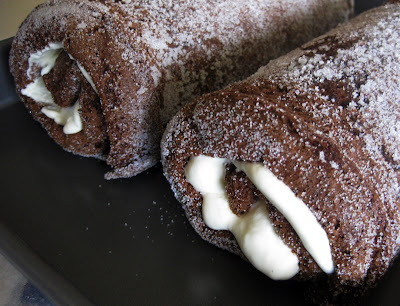 If there are any chocoholics in your family then you should definitely make these! In a large saucepan over medium heat, whisk together the cream, sugar, orange zest and cocoa until it comes to a full rolling boil. 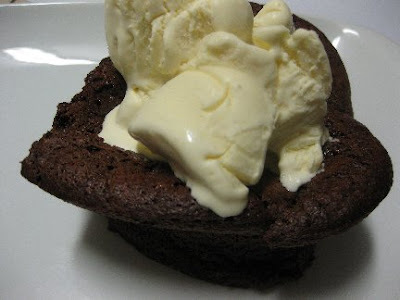 Remove from the heat and add the chocolate, whisking until it is completely incorporated. Stir in the milk, vanilla, cinnamon, salt, chilli and brandy. Pour the mix into a blender or food processor and blitz for 30 seconds or until completely smooth. Chill the mixture thoroughly in the fridge and then churn in your ice cream maker according to the manufacturer's instructions. Preheat the oven to 180 degrees celsius (160 degrees fan-forced). Line the base of a 9 inch square baking pan with baking paper and place on a baking sheet. Whisk together the flour and salt and set aside. Place a heat proof bowl over a saucepan of gently simmering water, put the butter and chocolate in. Stir frequently until the ingredients are just melted-you don’t want them to get so hot that the butter separates. Add the brown sugar and whisk gently just to incorporate it, then remove the bowl from the pan of water. Stir in the vanilla and transfer to a large bowl. Put the remaining cup of sugar into the bowl of a stand mixer or a medium bowl and whisk in the eggs. Switch to a rubber spatula and little by little add half of the sugar-egg mixture to the warm chocolate, stirring very gently without stopping-you don’t want the heat of the chocolate to cook the eggs. With the whisk attachment or with a hand mixer beat the remaining sugar and eggs on medium-high for about 3 minutes, or until they double in volume. Using a spatula and a light touch, fold the whipped eggs into the chocolate, stopping just short of blending them in completely. Sprinkle the dry ingredients and the nuts over the batter and delicately fold them in, working only until they disappear. Scrape the batter into the pan and smooth the top with the spatula. Bake for 25-28 minutes, or until the top looks dry. Use a thin knife to check for doneness - the brownies should be only just set and quite gooey. (Mine took about 40 minutes to reach this point so just keep an eye on them and keep checking regularly). Transfer the pan to a rack and cool to room temperature. Cut into pieces while still in the pan. Makes approx 16. This week our fearless leader Laurie of Slush chose Dorie's Unbelievably Good Chocolate Blueberry Ice Cream. Now I love chocolate ice cream and blueberries but I have to admit I wasn't sure about this combination, especially when it involved mixing ice cream with jam! As it turned out though, after forgetting to buy any blueberry jam (no really! I did forget!) 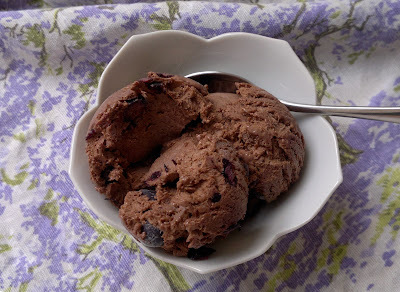 I subbed in frozen blueberries and ended up with the most luscious chocolate ice cream punctuated by sharp icy berries. Delicious! It took hubby a little while to hunt down our ice cream maker. We moved in to this house over a year ago and it never really got unpacked. This has reminded me just how good homemade ice cream can be and I foresee a whole lot more being made this summer! 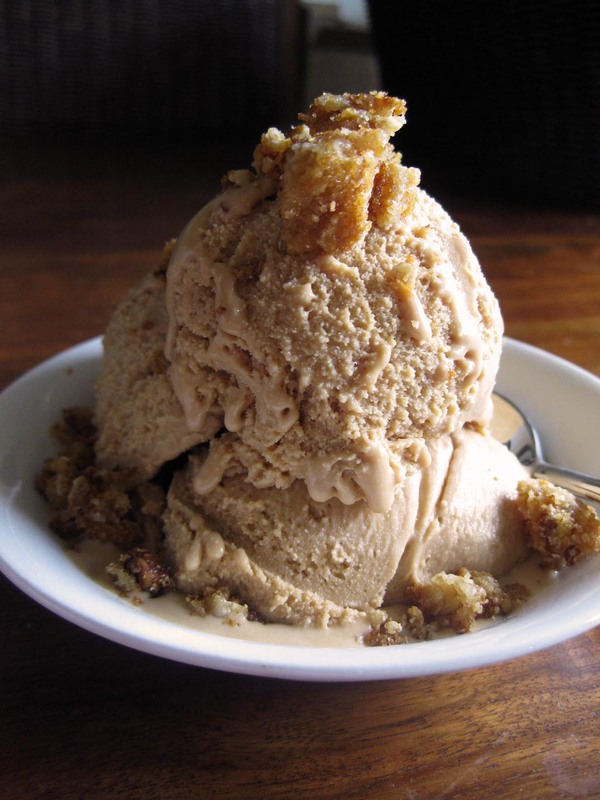 You will find the recipe for this amazing ice cream on Laurie's blog under today's date. While I am a lot more relaxed with food this pregnancy the raw/undercooked egg thing still spooks me. So rather than make a batch of what I am sure is truly awesome ice cream that I won't eat, this time around I just made the ganache. I turned a lovely, creamy vanilla ice cream into rocky road by adding chopped marshmallows, chocolate covered peanuts and a few jelly babies and topped it all off with lashings of gorgeous chocolate ganache. This was sweet, rich and very naughty! I'm sure it doesn't even come close to the deliciousness of the original recipe but we enjoyed it anyway. Thanks to Katrina for a great pick! It is now top of my list for post-pregnancy baking. Incidentally I finally got around to ordering The Perfect Scoop by David Lebovitz so I predict a lot of ice cream this summer! It may be the middle of winter here but it's never too cold for ice cream! This was a brilliant challenge. I've long been afraid of making a swiss roll after a disastrous experience years ago. Although when I think back I was probably about 12 and I'm almost certain I tried to roll up my cake while it was cold. Anyway, this time around was a cinch! My cakes cooked in the time specified, they came out of the tin easily and they rolled up perfectly. I may have gone a little overboard on the sugar but this made for a gorgeous crackly texture once frozen. 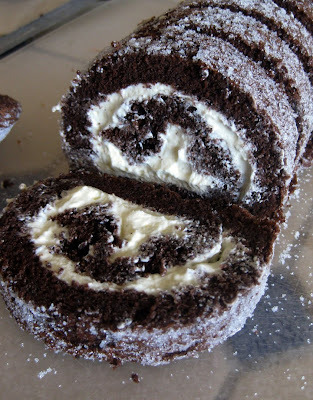 The brief was to make 2 chocolate swiss roll cakes filled with vanilla cream, to line a bowl with the slices and fill the interior with ice cream. I was so glad we were having visitors to help us eat this otherwise it would be ice cream cake for months! I used plain vanilla ice cream for the top and bottom layers and filled the middle with a caramel ice cream flavoured with fruit mince. This gave the bombe a Christmas in July sort of feel. Well it's cake, cream and 2 types of ice cream ... there's no way this can be bad! We loved it! It was also surprisingly easy for such an impressive looking dessert. Turn this baby out at the table and you are guaranteed some ooohs and aaahs! Thanks for a wonderful challenge Sunita! You will find the recipe on her blog here. This week Spike of Spike.Bakes chose Dorie's Banana Coconut Icecream Pie and I have to admit, I really wasn't sure about this one! Even after reading the recipe I had no idea whether this was something I would enjoy or not. Still, I ploughed on but couldn't resist making a few changes. My version has a plain shortbread crust (no coconut) and 2 layers of filling instead of one. I didn't want to mess up the creamy perfection of the chocolate ice-cream so I made a separate banana layer using some of my stash of frozen bananas whizzed up with a teaspoon of vanilla essence and some heavy cream. 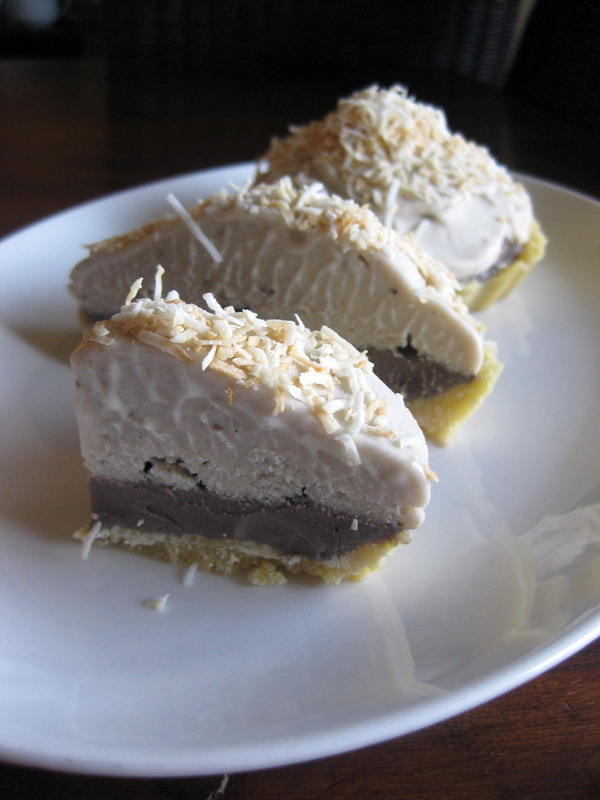 I then sprinkled some toasted shredded coconut on top. Not bad! Probably not something I would make again but banana and chocolate are always a great combination. 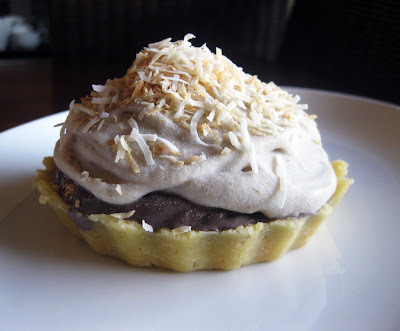 I'm glad I didn't use any rum in the filling or coconut in the base. The flavours here were just right for us. Thanks for an interesting pick, Spike! You can find the original recipe at Spike.Bakes under today's date. This week Becky of Project Domestication chose a recipe I have long been drooling over ... Burnt Sugar Ice Cream! This is pretty much caramel ice cream on steroids. I had no real problems making this apart from letting my custard cook a little long. See I was at the crucial 'stir until it thickens' stage when I realised I hadn't converted the 180 degrees F into celsius and so had no idea what temperature I was waiting for. By the time I yelled for husband to google it my custard had reached 92.5 degrees C, a smidgen too hot, but at least there can be no complaints about raw eggs! My only other issue was trying to take a photo without someone sticking his little fingers into it! 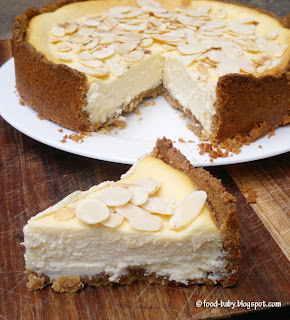 I topped mine with crumbled anzac biscuits for an extra sugar hit and some texture. Thanks for a great pick Becky! You can find the recipe on Becky's blog or for much better photos than mine, check out the TWD blogroll. Cold weather has never stopped me eating icecream but this week it almost stopped me making it! We've had a bit of a cold snap here and it's been casseroles, braises and puddings all round. Tommi from Brown Interior chose Dorie's Honey Peach Icecream this week. This is the icecream picture in the book that made me want to lick the page when I saw it. So you can imagine I had high expections. I decided to leave the honey out because I hadn't gotten around to buying something a bit more interesting than good ole capilano. 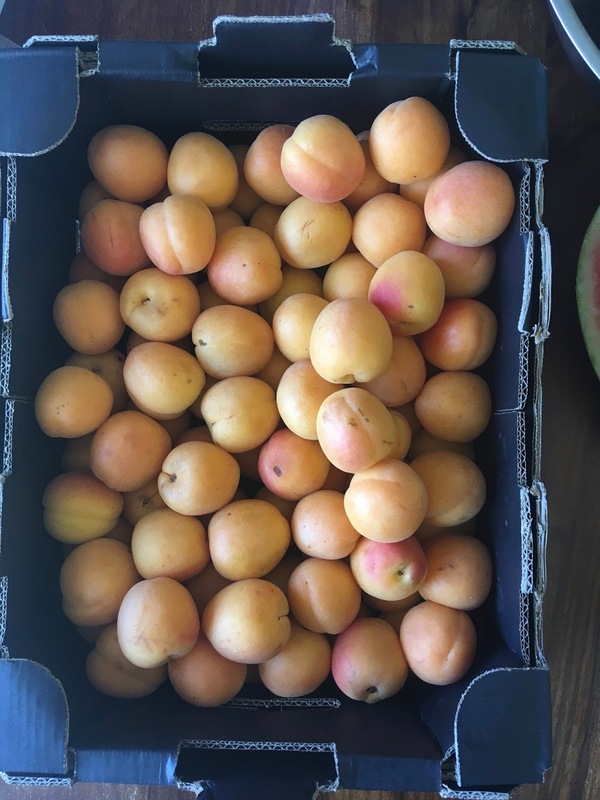 The first issue was that being winter here stone fruit is definitely not in season. 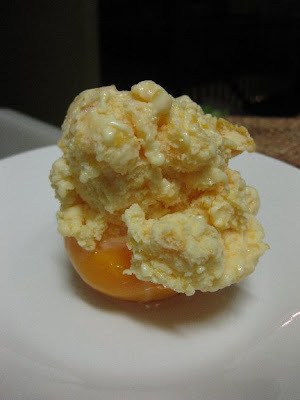 A few people suggested frozen peaches but I've never actually seen those so went the canned option instead. I drained them well but was still worried there would be excess liquid. The second issue was that my custard reached temperature too quickly (stupid 30 year old electric cooktop). It thickened but didn't look like a normal custard. I left it overnight in the fridge after stirring through my pureed peaches. Thirdly when I took it out the next day it looked like baby vomit. Seriously. All curdled and with little lumps. Ewww. It also smelt very eggy. Hmmm where has all the peach gone? I really could barely taste it. Apart from the colour I would have real trouble picking the flavour. It also left a horrible fatty coating on my the spoon, my mouth, the bowl. Damn. I was really disappointed by this one. Fruity icecreams (and desserts in general) are my favourite so I was really hoping this would be a winner! I definitely think fresh, beautifully ripened peaches would boost the flavour and the idea of steeping the peels and the stones could work too. On a happier note I've already made next weeks pick and it was FANTASTIC. To check out Tommi's version visit her blog or see the TWD blogroll to hopefully find some better icecreams than mine. I am a little off my game at the moment. I think I've mentioned before how I have been misreading recipes a bit lately. This time I read everything correctly but I went ahead and stuffed up anyway! I ended up with far too much batter for my little pan and clearly remember saying to N "the recipe says to fill the pan 3/4 full" as I blithely went on and scraped every last bit of batter into the pan so it was practically overflowing. I'm sure you can guess what happened. We had a chocolate volcano explode in the oven. I would show you the photo but I'm too embarrassed about our dirty oven. So my cake is not the prettiest (it honestly never occurred to me until a week later that I should have just pulled off the lumpy lava edges and turned it upside down for the photos) but my husband assured me it was absolutely sublime and suggested several times that if I really wasn't happy I should just make it again. Isn't that sweet? He's always thinking of his stomach me. Note – If you do not have an instant read thermometer, the top of the cake will look similar to a brownie and a cake tester will appear wet. Whip cream until it just starts to thicken then while still beating, drizzle in the condensed milk followed by the vanilla. Whip until it has at least doubled in volume. Freeze. Eat. Swoon. Make sure you check out the other DBs posts for cakes far prettier than mine!